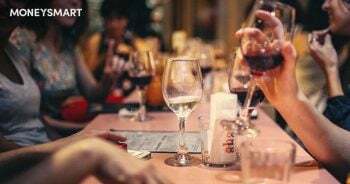 This post was written in collaboration with Qanvast. While we are financially compensated by them, we nonetheless strive to maintain our editorial integrity and review products with the same objective lens. We are committed to providing the best recommendations and advice in order for you to make personal financial decisions with confidence. You can view our Editorial Guidelines here. Buying a new home might possibly be the biggest purchase you might make in your life, but let’s just admit that it’s really the renovation that is the true headache when it comes to moving in. A major (if not the most important) factor in any home overhaul, budgeting for one’s renovation can be confusing at best. When should you start saving? How much should you set aside, and is the amount enough for the works you plan to do? Applicable to HDB and Condo properties only. Considering how most renovations require cash payments to be made, it pays to provide yourself ample time to save up! 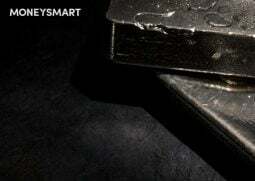 More than 50% of homeowners reported planning their finances while waiting to collect their keys. 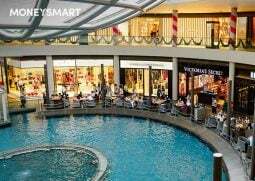 Another 37% went a step further – planning before even purchasing their unit. *Want to know how much you should set aside for your renovation? Get an estimated budget in just a few clicks with Qanvast’s Renovation Calculator. 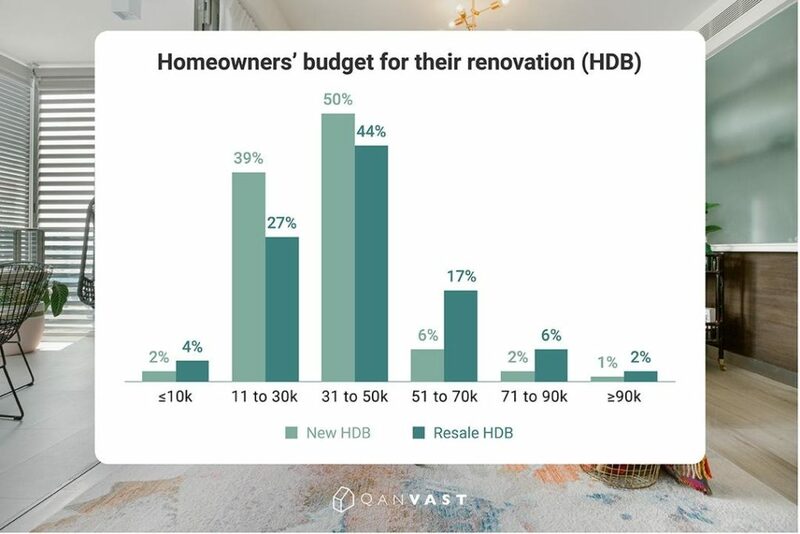 Across both property types (HDB or condo), a majority of homeowners expected themselves to spend anywhere from $11,000 to $50,000 on renovation works alone. That being said, they were also likely to budget more for resale properties compared to new units. 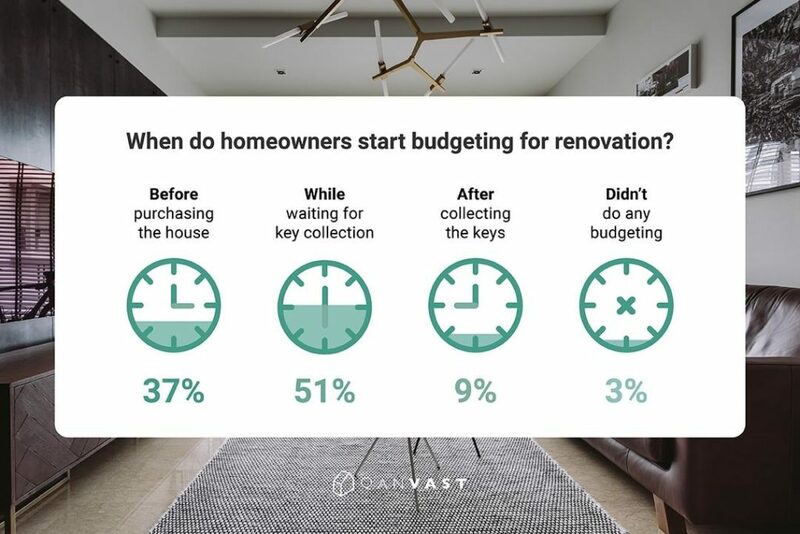 For instance, 17% of homeowners expected to spend $51,000 to $70,000 on renovation for their resale HDBs, compared to just 6% planning on the same amount for new HDBs. Likewise, respondents expected to spend less on new condos. Almost 50% of those surveyed said they were looking to spend $11,000 to $30,000 on renovations for their new condo unit. One possible reason could be due to the fact that existing, brand-new bathroom and kitchen fittings often come with these units, which don’t require changing. Expectations are one thing, but what about actual spend? 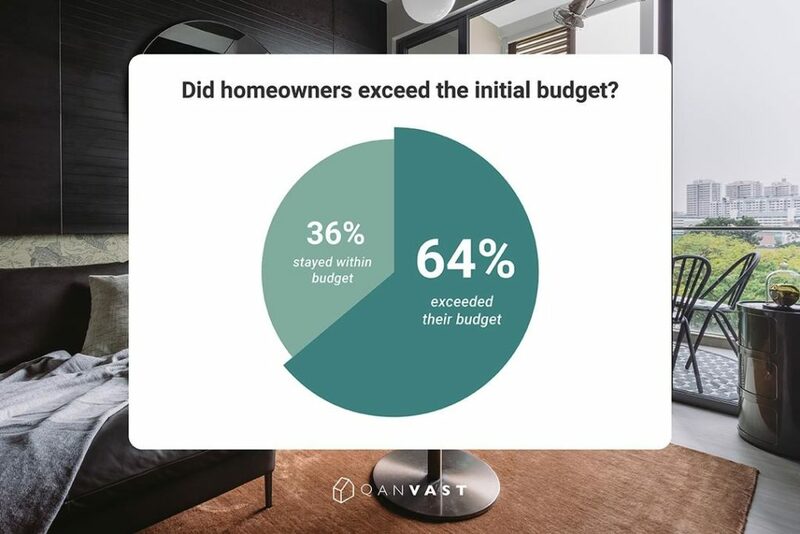 Amongst homeowners who have completed their renovation, almost 64% have reported exceeding their initial budget. But don’t raise those red flags just yet. In fact, when looking at the expected versus actual spend for completed projects, homeowners only spent an average of 6.1% more than their expected budget. The key takeaway here? Always set aside a buffer of 10 – 20% of your initial budget for any unforeseen circumstances which might crop up along the way, like last-minute alterations or additions. 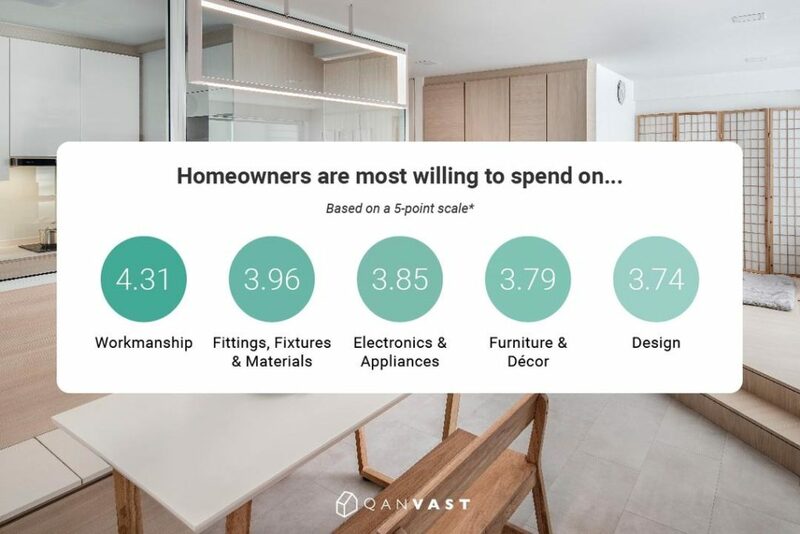 While 36% of homeowners said they were most willing to splurge on their living room, those who’ve completed their renovation reported spending the most on their kitchens instead. Well, when you take into consideration the amount functional elements needed (e.g. countertops, cabinets, built-in appliances, storage units) and traffic going into this part of the house, it may be wise to pay a bit more for a durable, practical space. 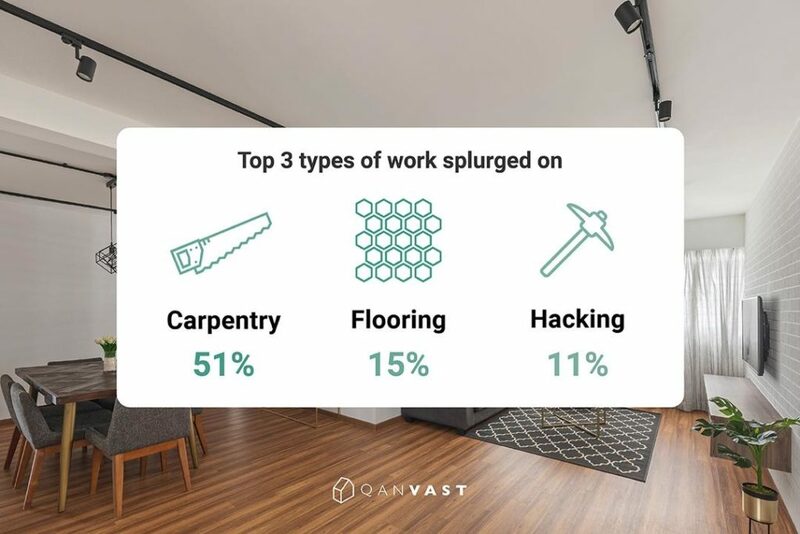 Flooring may often be said to rack up a sum (sometimes up to tens of thousands of dollars), but turns out, carpentry works take the top spot when it comes to renovation cost. Over 50% of homeowners reported spending the most on building storage compartments, cabinets, shelves or other built-ins. Trends and fads come and go, but a good home should be built to weather through the years. This will certainly save you a lot of heartache and money when it comes to maintaining everything in your home. Local homeowners think the same too, rating good workmanship (4.31) as the top factor they were most willing to spend on their renovation. On the flip side, design was ranked last (3.74) – guess we Singaporeans are a pragmatic bunch. There is, however, the issue of first choosing who you are getting to work on your home. Qanvast makes this process a whole lot easier by connecting homeowners to interior designers, and giving you the power to choose what you like based on what you see. 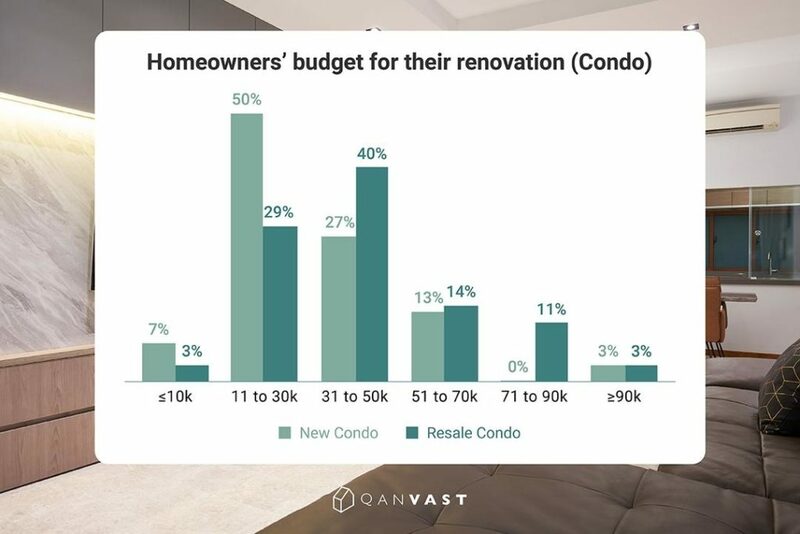 Qanvast is the go-to renovation platform connecting homeowners to interior designers. 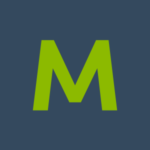 Submit this short form to get a curated list of interior firms, handpicked for you based on your renovation requirements – quote ‘MoneySmart’ under ‘Other info’ to get $50 worth of Capitavouchers! Terms and conditions apply. Promotion ends in March 2019.